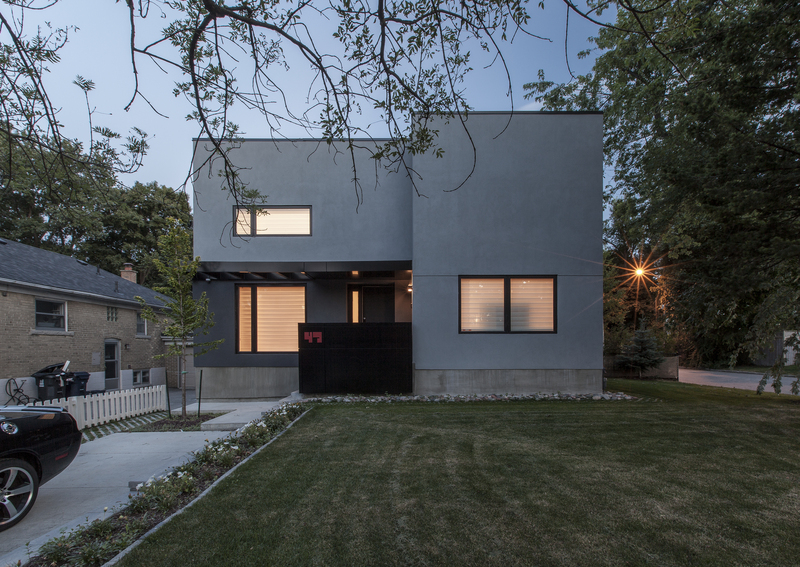 To create visual depth, the entrance of the Thorax House’s gray stucco facade is marked by a black aluminum canopy. The firm created custom signage using red Caesarstone quartz, which was cut using a CNC milling machine. “It’s like a suit with a nice tie,” Aliabadi says. A staircase forms the core of the 1,800-square-foot home, with a symmetrical alcove on either side. The steps, hardwood floors, and slatted bridge on the second floor are made of white oak, providing a rich contrast with its white walls. Instead of isolating the dining table and kitchen island, Aliabadi chose to raise the dining room floor in order to keep both surfaces the same height. The custom dining table is surrounded by Selene white leather chairs and an E23 wood bench. A lighting fixture from Royal Lighting hangs overhead. The polished, matte white glass refrigerator and fridge complement Miele appliances and the IKEA kitchen system. A panel of red-painted glass adds a pop of color. A large slab of marble doubles as an artwork in the living room, which is accented with an E23 sofa. Aliabadi used leftover pieces of the marble to create a custom coffee table. From the top of the staircase, the master bedroom is accessed via sliding doors (on the right), while a pair of pocket doors lead to a walk-in closet that overlooks the living room. A skylight with an operable shade provides natural light when desired. A fiddle-leaf tree, which the homeowner has had for 25 years, fits perfectly into the double-height living room, where it enjoys plenty of sunlight. Its tip can be seen from the master bedroom’s walk-in closet. The thorax may be a curious source of design inspiration, but for Canadian firm rzlbd, it provided a smart solution for maximizing the buildable area of a small space. Challenged to build a home on the site of a recently demolished bungalow, architect Reza Aliabadi took advantage of existing zoning laws by adopting the former building’s footprint and thorax-like floor plan. “The bungalow had a ‘spine,’ the staircase, with functional spaces, or ‘lungs,’ on either side,” Aliabadi says. “We wanted to incorporate that model in a way that spoke to our client’s desire for a pared-down, modern home.” True to its name, the Thorax House’s double-height ceilings and efficient layout offer plenty of room to breathe. An entry foyer gives way to a staircase flanked by a pair of symmetrical alcoves. One side houses a living room with soaring ceilings, while a dining room and kitchen comprise the other. Upstairs, a slatted wood bridge provides access to two bedrooms connected by a shared bathroom. Pocket doors and skylights with operable shades provide natural light, and offer privacy without obstructing the home’s systematic design.